Kelly Ripa and Michael Strahan continued with Live! With Kelly & Michael’s “Kick Start the New Year: Wellness Edition.” I’ve really been enjoying the “Kick Start the New Year” segments, and I liked that they’re doing a wellness week. I think it’s just as important as fitness or nutrition. I was actually a little disappointed that they had run out of time during their first “Kick Start the New Year: Wellness Edition” segment. They talked about it a bit during the host chat. Success doesn’t always equal happiness. They did a web exclusive to make up for the lost time and they said it really helps. Wellness is an extremely aspect to healthy living that people often don’t think about, and I’m glad they’re shining a light on it. This time, they learned about acupuncture and cupping while New Kids on the Block played as the house band. 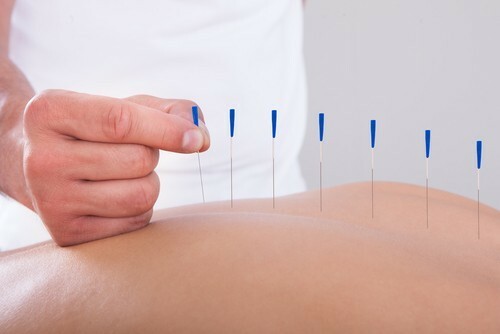 Acupuncture can help alleviate pain, treat a variety of illnesses, and even give you a face lift. Dr. Daniel Hsu came by to talk about it. It calms the body’s nervous system down. Michael loves acupuncture. He likes electric stimulation. It makes it stronger and alleviates pain. Kelly signed up for a treatment. She has congestion, but she wanted to face lift. He used special, small facial needles. He joked he was going to use the big ones on Michael. Kelly didn’t even notice when they went in. It was painless. Then she just had to rest. Michael then signed up to work on his back. People were very excited he was taking his shirt off. Then the doctor put needles in his back. He joked that it really hurt. He didn’t feel it all though. Then Dr. Hsu did a cupping demonstration. It’s like suction cups. He did it on Michael’s back. Kelly asked if an ecosystem would form on his back. They create pressure and increase blood flow. It looked a little uncomfortable, but it seemed like Michael was comfortable.